Staibdance director George Staib talks about the inspiration behind the March 21-23 performance of "Versus." Photo courtesy of Burnaway magazine. Staibdance's "Versus" runs March 21-23 at 8 p.m. in the Dance Studio of the Schwartz Center for Performing Arts. Tickets are $15 general admission, $12 for discount category members, and $8 for students. For details, visit arts.emory.edu or call the Arts at Emory box office at 404-727-5050. George Staib, senior lecturer and artistic director of contemporary dance company Staibdance, wants to know why the human race is so conflicted. Tension as it exists interpersonally as well as internally serves as the inspiration for Staibdance's "Versus," showing in the Dance Studio of the Schwartz Center for Performing Arts March 21-23. 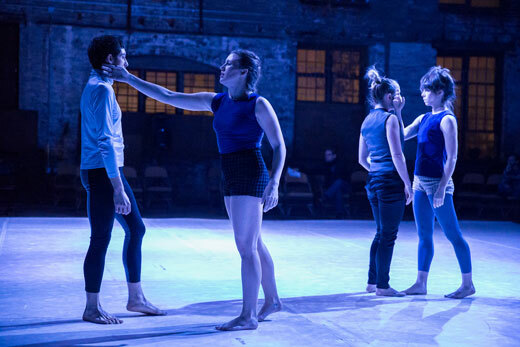 With "Versus," Staibdance explores both psychological and physical conflict. What about this subject matter inspired you to create an evening of dance? I knew I wanted to revisit some older material and, in looking at them, I saw a common thread. The pieces I was most drawn to dealt with either an interpersonal conflict of some sort, or an internal one that lingers and takes its toll on your relationships with others. The conflicts, therefore, are personal and speak to the way we see and interact with the world; not everyone, of course, but those who tend to dissect and analyze. When I first began the project, I was looking at all kinds of conflicts – the cardinal literary ones: man vs. man, man vs. nature, man vs. fate, and so on. I soon established that that would be a herculean task and I needed to narrow my scope. So the evening is dedicated to the things that are closer to home. An intimate look at an intimate subject. How have you approached putting such a complicated and often ugly subject on your dancers' bodies? This experience has been exciting. Any dance-maker will want his or her work to look polished, but I am seeking a different way of unifying the dancers. Yes, I want them to be doing the same things, but their personal interpretations of the movements are extremely valuable to me. I am investigating whether or not the source or impetus of the movement, if consistent from dancer to dancer, will present the audience with a collective feeling. In other words, as long as the movement starts in the same place, I think it can go in different directions thereafter and still be meaningful and "readable." I am also consciously steering away from pretty shapes, and classical images of dancers. Those don't belong at all. Conflicts live in grit and dirt, they may be covered up with pretty things, but at the source, conflicts are unsavory places to be. So, I am inviting beauty via reality, not beauty via decoration. How has this different approach to creating work altered the way you communicate with and direct your dancers? In coaching the movement, I ask the dancers to feel the implications of the movement: "What does it mean to bang your head against your hand? What does it mean to throw this punch? What are the natural outcomes of being touched tenderly when all you feel is anger?" The movement has become a roadmap; the dancers are welcome to detour—within reason, of course!